Proper hose selection is the first step in preventive maintenance. Selecting the best product for the application will allow you to obtain the maximum life expectancy from the product for the best value. When selecting the correct hose, use the acronym STAMPED (Size, Temperature, Application, Material being Conveyed, Pressure, End Requirements, Delivery) as your guide. LEARN MORE about using the STAMPED method. The red hash marks are representative of Overall Length measurement or OAL in 3 common hydraulic hose assemblies. We measure from the end of the male fitting to the center of the angled female fitting. For further questions, please contact our inside sales team. Hose Fitting Orientation is measured in a clockwise direction. Look at the along the hose with the furthest fitting away from the viewer (0 degrees) and the nearest fitting closet to the viewer (orientation angle in degrees). 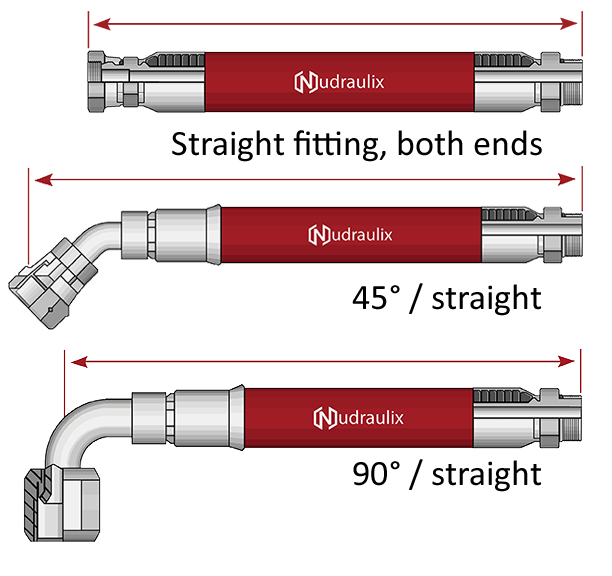 Use the illustration below as a reference when discussing with our staff your next hose assembly. 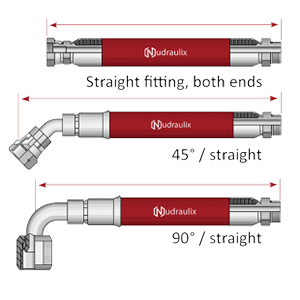 Hydraulic hoses and fittings can be assembled in the Nudraulix warehouse to your precise specifications. 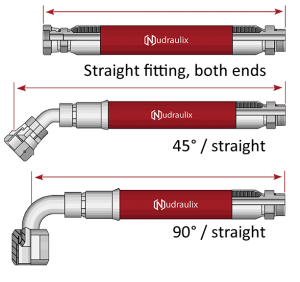 At Nudraulix, we have the in-house capacity to manufacture custom hose assemblies with permanent, crimped hose ends. Each hose assembly is made to your specifications and every hose is tested for quality assurance.